A two-channel hybrid combiner for wireless base station applications is available in PCS 1900, DCS 1800, AMPS, and EGSM frequency ranges. The model 1409296/H has an internal load up to 50 W and low incidence of IM. 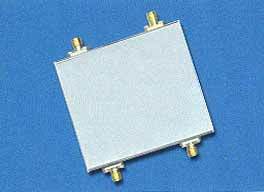 The small, robust, magnetically screened combiner has internal load or connector configuration packaging options available.